The rise of the concept of ‘library as publisher’ has caused many university libraries to consider their role in the world of open access (OA) publishing and how that supports digital scholarship at their institutions. This paper outlines Liverpool John Moores University (LJMU) Library Services’ first steps into that world through the offering of an open journals hosting service. It begins by explaining the background and justification for the library offering such a service and details the pilot undertaken to test the chosen system, Open Journal Systems (OJS). It considers what policies, procedures and support need to be in place in order to run a successful open journals hosting service. Lessons learned and observations gathered during the pilot are shared to help others considering setting up an open journals hosting service in their own institution. Finally it looks at the next steps for LJMU in taking this pilot forward to a full service offer. ‘Library as publisher’ is a concept that has been gaining ground in recent years and Collister et al.1 argue that participation in publishing is a natural area for libraries to engage in. This concept forms part of the broader area of digital scholarship, which Cox2 argues provides opportunities for new roles for library staff. It seems a sensible step to move from disseminating other people’s content to disseminating content produced at our own institution. This begins with making outputs available via an institutional repository, in particular to support HEFCE’s (the Higher Education Funding Council for England’s)3 requirements for the next Research Excellence Framework (REF), but should not end there. Open access (OA) publishing is a logical area for libraries to get involved in. With this in mind, Library Services at Liverpool John Moores University (LJMU) made the development of the library as publisher a key strategic aim in 2015–2016 to support the University’s Embedding Research and Scholarship strand of the 2012–2017 strategy plan.4 In a bid to begin to realize this aim, the Open Journals Systems (OJS)5 was investigated. A number of other university libraries are engaging with OJS and this appears to be a growing area as demonstrated by a recent event held at the University of Manchester.6 The focus there was on student publishing but some universities (like Universities of Edinburgh and Warwick) offer hosting for both student- and academic-level journals. A subscription to OJS, hosted by the University of London Computer Centre, was purchased as part of a curriculum development project, but the potential of the system had not yet been fully explored. OJS is a journal management and publishing system developed by the Public Knowledge Project with the purpose of making OA publishing a viable option for more journals. In order to determine whether an open journal service was something the Library Service could and should offer as part of its digital scholarship strand, it was decided to run a project to pilot the system. We based this on the open journals hosting services at the Universities of Edinburgh and St Andrews, and adapted their materials for our purposes. We approached two existing journal managers at LJMU who, due to web pages being moved to behind a log-in, we knew were looking for a way around this and potentially a new platform to host their journals. One journal, SPARK, was a student journal which gave students an opportunity to adapt an assessed piece of work into a journal article suitable for publication. This journal also had a staff and student editorial team. The other journal, Innovations in Practice, was a staff journal which enabled staff to publish work around the areas of pedagogic research and teaching practice. At an initial meeting it was agreed that the journal managers of these two journals would pilot OJS for us and I would take on the role of project manager. At the same time one of our liaison librarians had been approached by an academic staff member in the School of Nursing and Allied Health for support in setting up a new journal. Again they were looking for somewhere to host this. We agreed this should be based on the SPARK journal, being a place for students to publish their work but also offering them a chance to be editors as well. From the perspective of the project as a whole, this was a useful development as it meant that the documentation we would need for setting up a new journal could be fully tested and revised accordingly so it would be ready to use if this was to go forward as a service after the pilot. It was agreed that a member of the project team (the liaison librarian in the subject area) and I would also be part of the editorial board for this journal, Links to Health and Social Care, in order to fully understand the system and what support a new journal would need. Training on the editorial aspects of the system was offered to all the journal managers and editors for the three journals. This was challenging as the system focuses very much on individual roles and in some cases participants took on more than one role. One particularly confusing session involved participants playing the role of author for some papers and editor for others, where it became clear that some participants were confused as to which role they were playing at which point in the training. As a result it was decided that the best way to move forward was for a member of the project team to play the author and the participants to take on the editorial role. This provided them with a clearer picture of what was required of them. It was agreed with all three journal teams that copyright would sit with the authors of the papers and that papers would be published with a CC BY-NC-ND (Creative Commons Attribution Non-Commercial) licence7 to allow reuse for non-commercial purposes. It was agreed that journals would be open access and advice on the types of licence that could be used was given. Each of the journals was set up on OJS, which involved creating a ‘new journal’ on the system for each one, i.e. deciding on a name if new, adding the appropriate editors and reviewers, agreeing policy information surrounding the journal and adding this information into OJS. This would then be visible to future authors so they could see, for example, the focus and scope of the journal, what type of papers would be accepted, what the review process would be and turnaround for review. Some degree of customization of the interface was also involved: adding a journal header, applying a unique brand to each journal and ensuring the LJMU logo was included. The aim was for all journals to release an issue before the close of the project. Progress was slow to begin with as the project team and editorial teams got to grips with the system. All three journals produced an issue during the project, but all took a slightly different approach. 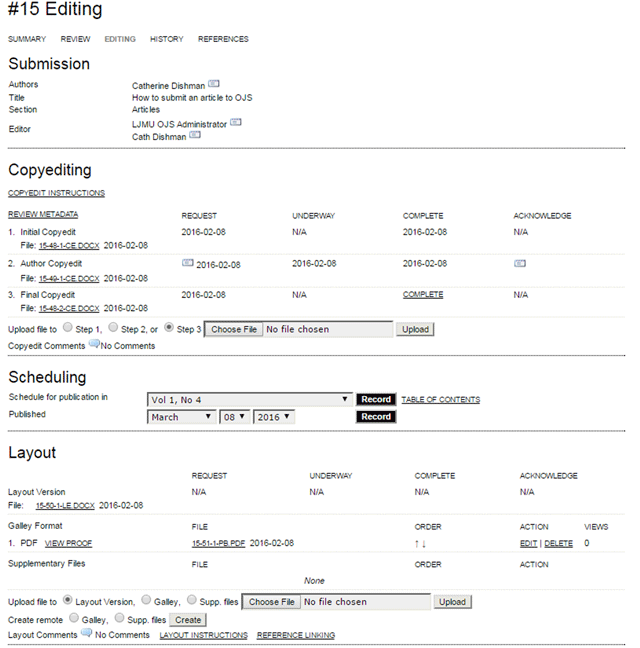 After the setting up of the journal (see Figure 1 for the home page), initial training of editors and the setting up of authors on the system, there was very little input needed from the library project team. The editorial team already had an established process in place for editing an issue and only needed support when using OJS for submissions. They used the system for submitting articles and some elements of the review and copy-editing process. However, they decided not to publish each article as a separate PDF within the issue, instead producing a full-issue PDF as they had done previously, so just required support to upload this onto OJS. This provided a place to host the journal and a stable URL to distribute. This journal had only one editor/journal manager and took a different approach (see Figure 2 for journal home page). Due to the additional support needed for authors to ensure the quality of paper the journal manager was looking for, articles were not submitted, reviewed and copy-edited through the system, so the journal manager worked closely with each author to develop their work to make sure it was ready for publication. Support was provided with layout, creating the PDFs for each article and uploading them to the system and publishing the issue. More support was needed here in the latter stages when the papers were ready to be formatted and published. The system was fully tested with this journal. The editorial team used all areas of the review, copy-edit and layout sections and were supported at each stage. Being part of the editorial team allowed me to play a full part in testing the system and understanding where changes to supporting documentation needed to be made. The challenges we faced as an editorial team did not just relate to the system itself but were to do with understanding the various stages of publishing a journal, as it was new to us all. The experience was invaluable as it gave us a clear understanding of what the system could do and what the editors and authors were required to do (and what support they needed) at each stage of the process. It was necessary to create guides that were specific to that journal and covered the requirements of the editors/reviewers in terms of the content of the journal (and requirements of the journal manager) whilst giving them the practical steps for what needed to be done on the system itself (where to upload documents, how to e-mail authors, etc.). Working closely with the journal manager, we produced a guide to support editors/reviewers (a joint role for this journal) and another one for authors. These new guides were tested for the second issue of the journal and resulted in fewer queries from authors and editors/reviewers on how to use the system and what was required of them at the various stages of the editorial process. Working with the Links to Health and Social Care team was useful as it enabled us to fully understand what a journal team needs from OJS and what their support needs associated with this are likely to be. Figure 3 shows the home page. All three journals are now well established and are approaching their third issue. All journal teams are now more independent and only need help with the final stages of compiling the issue prior to publication. To begin with, the system can seem a little overwhelming and the ‘Editing’ section (shown in the screenshot, Figure 4) in particular caused some confusion, necessitating additional support. Training on the system is therefore essential for any new journal editorial team members. 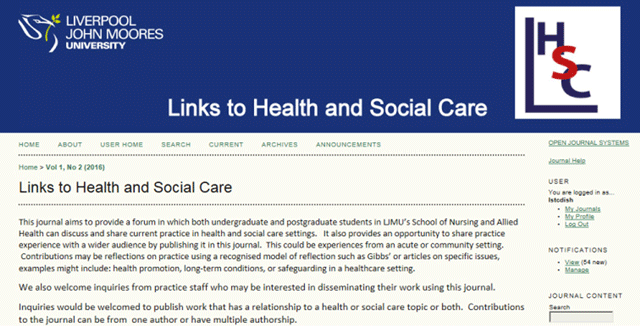 The journal manager of Links to Health and Social Care and one of the student editors and authors presented at the Royal College of Nursing Education Forum ‘Nursing education and professional development: the global perspective’ in March 2017 on their experiences with OJS. They received very positive feedback and there was a lot of enthusiasm and discussion about the possibility that it might help to meet some of the new Nursing and Midwifery Council standards for nursing education. Innovations in Practice has been included in the ROAD Directory of Open Access scholarly Resources and articles have been cited in other international peer-reviewed education journals. The journal manager is very keen to raise the profile and impact of this journal. It is important to develop a policy for the service outlining what the service does and does not offer and what level of support is available. Think about the level of customization that as a service you are willing and able to offer each journal and ensure this is outlined in the policy. Think about how much time will be given to each journal for the first issue, second issue and beyond. This will probably vary but needs to be laid out, and it will also influence how many new journals the service will be able to take on at any one time. It is necessary to consider ownership of individual journals. Who is responsible for the content, ensuring progression if key people leave? Consider also what happens if the journal folds. A successful service would not be one which holds a multitude of journals that only produce one issue and then fold! The reputation of the institution needs to be taken into consideration as well, and faculty staff are best placed to offer some kind of quality control. Having backing from senior managers in the appropriate area of the institution, for example directors of school or research groups, means that there is a check in place prior to a new journal being started. It is essential to ensure there is enough capacity in the team to deliver the level of support described in your policy. The initial set-up of the journal can take time, especially with inexperienced journal managers and once the journal is set up journal managers will generally need more support to produce their first issue using OJS. However, there will be ongoing support needs which need to be taken into consideration. A recommendation would be to start small and then it is possible to assess the level of support that will be needed. There needs to be a commitment on the part of the journal manager to develop their procedures and policies relating to their journal, and with a new journal more support is needed in this area. We are aiming to develop workload estimates for journal managers and editors based on the number of issues and articles per issue for the proposed journal. This will help journal managers and editors understand from the outset the degree of commitment needed to maintain a journal. In addition, library management need to be committed to offering this service in order to ensure adequate resource is available to support it. At LJMU we had the support of library management as the project supported the University’s Embedding Research and Scholarship strand of the 2012–2017 strategy plan8 and our own Management Team acted as project board for the pilot project. Finally, to ensure a successful service, there is a need for organizational-level buy-in. If support is gained from the organization, this will boost the profile of the service and make it easier to deal with ‘problem’ journals. It can be a challenge convincing senior management that offering an open journals service is a worthwhile venture for the institution. It requires linking it to your strategic plan and outlining potential benefits. Having developed our service policy, the next step for us is to get University approval for it and to gain the support of key groups. In particular there is a need for schools and faculties to be aware of and take responsibility for any new journals that are proposed. We would like to get more research- rather than teaching- and practice-focused journals using the system so we can test other areas like blind peer-review and situations where the roles of editor and reviewer are carried out by different people. Another area we need to develop is around the marketing of current journals. How do we get the word out and improve the profile of our existing journals? Some of the responsibility for this sits with the journal managers, but in order to boost the profile of the service as a whole the library team needs to take a role in this. To aid discoverability we would support journal managers with applications for inclusion in the Directory of Open Access Journals.9 We also are beginning to tweet links to new articles from our Research Support twitter feed @LJMUResearch10 and will include promotion of our current journals at our Teaching and Learning Conference, as well as encouraging potential new journal managers to get in touch. There is also the potential for partnerships with other institutions. The Links to Health and Social Care team in particular is keen to work with other institutions to further boost the profile and reach of the journal. As the system is online and can be accessed anywhere, this works well for cross-institutional collaboration. The institutions do not even need to be in the same country, and the Links to Health and Social Care team is looking to collaborate with Karelia University in Finland. OJS is a versatile system and it is not necessary to use every aspect of it to benefit from it. When we started this project, we envisaged that all the journals would use the system in the same way, but this did not turn out to be the case. Buy-in from your organization, library management, your service manager and journal managers is essential to make a journal service work as, without commitment, journals will fold. Providing appropriate levels of support is key too because if inexperienced journal managers are left too much to their own devices, especially at first, they may feel overwhelmed and the journal is more likely to fail. In the broader context, working with journal managers and editors offers an excellent opportunity for library staff to develop relationships and promote the library as a partner in the enabling of digital scholarship within their organization. Collister, L, Deliyannides, T and Dyas-Correia, S (2014). The library as publisher. The Serials Librarian 66(1–4): 20–29, DOI: https://doi.org/10.1080/0361526X.2014.879524 (accessed 25 May 2017). Cox, J (2016). Communicating new library roles to enable digital scholarship: a review article. New Review of Academic Librarianship 22(2–3): 132–147, DOI: https://doi.org/10.1080/13614533.2016.1181665 (accessed 25 May 2017). Higher Education Funding Council for England (2016). Policy for open access in the next Research Excellence Framework: updated November 2016. London: HEFCE. http://www.hefce.ac.uk/pubs/year/2016/201635/ (accessed 25 May 2017). Liverpool John Moores University (2012). 2012–2017 strategic plan. Liverpool: Liverpool John Moores University. https://www.ljmu.ac.uk/~/media/files/ljmu/public-information-documents/strategic-plan/strategic_plan_2012_17.pdf?la=en (accessed 25 May 2017). Public Knowledge Project: (). https://pkp.sfu.ca/ojs/ (accessed 26 May 2017). Dobson, H (2017). Supporting student publishing: perspectives from the University of Manchester and beyond. Library Research Plus blog. February 28 2017 https://blog.research-plus.library.manchester.ac.uk/2017/02/28/supporting-student-publishing-perspectives-from-the-university-of-manchester-and-beyond/ (accessed 16 May 2017). Creative Commons: (). https://creativecommons.org/licenses/by-nc-nd/4.0/ (accessed 26 May 2017). Liverpool John Moores University (). ref. 4. Directory of Open Access Journals: (). https://doaj.org/ (accessed 26 May 2017). LJMU Research Support: (). https://twitter.com/LJMUResearch (accessed 26 May 2017).